She ran through her neighborhood at night, screaming and banging on doors. She broke all the windows of her trailer and threw furniture and debris into the yard when she was evicted from it last month. She’d been charged with numerous minor criminal offenses here and in Texas, where she lived for a time. Her stepmother and father from Fort Wayne thought she posed a danger to her preschool son and took out protective orders against her. A few years ago, she was questioned – twice – in the suspicious death of a Fort Wayne man whose body was found frozen in a Whitley County field, according to law enforcement there. That picture emerged Tuesday of Amber Susan Pasztor, 29, of Fort Wayne, charged with killing two of her children and possibly linked to the death of a former neighbor, Frank Macomber, found Tuesday in woods near where the children were abducted from their Fort Wayne home. The children, Liliana Hernandez, 7, and Rene Pasztor, 6, were asphyxiated, according to the Elkhart County coroner’s office. Pasztor was known in her former neighborhood and in court records for erratic behavior. On Monday, a probable cause affidavit was filed alleging that on Sept. 14, Pasztor violated protective orders issued on behalf of her surviving son, Juelz Santos Aguirre, 3, and her stepmother, Emily Green of Fort Wayne. Her father, Ricky Green, told authorities that Pasztor had threatened through telephone and text messages to take the children away from him, although her parental rights had been terminated. As a result, a warrant was issued for Pasztor on an invasion-of-privacy charge. Court records filed in February 2015 by the Greens seeking custody of Juelz state that the couple had taken care of him since September 2014 with Pasztor’s permission. Pasztor and the child’s father, whose whereabouts are listed as unknown, could not provide a safe environment for the child, the records state. The custody case had not been resolved by July, when an Allen County judge noted "the underlying CHINS proceedings," according to online documents. Child in Need of Services (CHINS) cases involve suspected instances of neglect or abuse. In filing for the protective orders granted in March 2015, Emily Green alleged that in December 2014, Pasztor had harassed and threatened to harm her and break into her house. She stated that in summer 2014, Pasztor repeatedly left Juelz alone all night and "would blast the stereo so neighbors couldn’t hear him cry." Emily Green also states in those documents that Pasztor abused drugs while living in Lufkin, Texas, in 2015, and was arrested there. Pasztor later returned to Allen County. Online jail records for Lufkin show Pasztor was arrested for possession of drug paraphernalia and drugs and driving offenses in 2013 and 2015 and was incarcerated. In a handwritten letter to the court sent from the Allen County Jail, where she was being held in March 2015 on an outstanding warrant from Johnson County, Indiana, Pasztor refused to give up custody of the 3-year-old child and alleged that Emily Green is "making all sorts of lies to keep my son." "I have never once hurt him and would not ever," she wrote. "I love my children with all my heart." Pasztor claimed she was willing to "better my life for them." "I refuse to give her (Green) custody," she wrote. "I am his mother. I refuse to give custody of my son and all my children." Among other charges Pasztor faced in recent years were driving offenses, including driving without ever receiving a license, criminal trespass, battery and disorderly conduct. Whitley County Sheriff Marc Gaston said Tuesday that Pasztor was questioned as the girlfriend of Rene Hernandez of Fort Wayne, who was found dead with his hands taped behind his back on Jan. 29, 2010, in woods near Whitley county roads 400 South and 700 East. She was pregnant at the time she was questioned, Gaston said, adding that Pasztor said the baby was Hernandez’s. Hernandez had been reported missing on Dec. 19, 2009. The case turned cold, he said. Residents of Countryside Village mobile home park in northwest Fort Wayne said Macomber and Pasztor were nearly back-to-back neighbors when Pasztor lived there. But she was evicted Aug. 2, according to an orange notice on her former home’s door. Neighbor Joe Blasco, who said he had cleared snow for Macomber, called him "a pretty cool dude" who had lived by himself for several years. Macomber’s older, but relatively neat, tan trailer with maroon shutters was cordoned by police tape Tuesday morning. 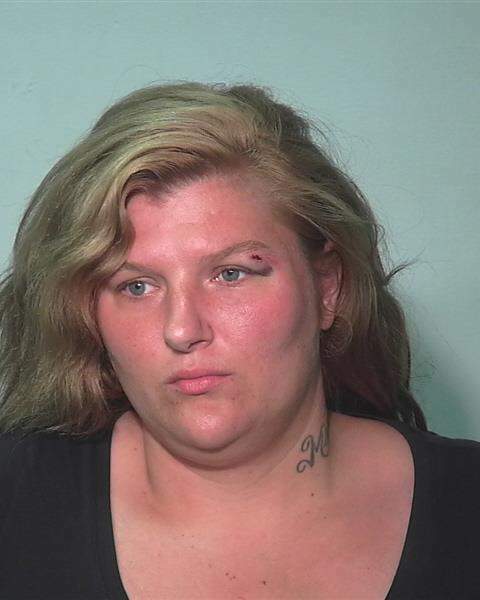 Blasco said Pasztor "got mad" and "smashed all the windows out of (her) trailer," damaged the trailer skirt, and dumped furniture and other belongings in the yard after she was told to leave the park. Windows had been replaced, but broken glass lay scattered on the ground outside. Blasco, who said he did odd jobs with the mobile home park’s maintenance worker, said he found ammunition in the yard when helping pick up trash. Other neighbors said Pasztor was involved in loud disturbances, accumulated debris in the yard and let her dog run loose. "She said she had been in jail and knew what it was like to not be able to come and go, so she left her door open (for the dog) all the time," said one neighbor, who asked not to be named.